Camping with Chris, Juanita, Rod, & Justin in August 2006. We are back from the camping trip. I am hot, sunburned & tired, but we had fun. The first adventure started when we got there. The camping site is about 20 miles from the cabin we stayed at in July. The group (Chris' friends from work) told us where (Blue Ridge Reservoir) but not "where" (Rock Crossing Campground, Site 23). To give them credit, they didn't know what site they would be at, but I didn't even know I was looking for a developed campground. Justin told Chris that if we had any trouble to call on the cell phone. There is no cell phone service up there. Justin knew this- we had no service at the cabin, either. So we get to the reservoir turn off at about 9:30 pm and as we drive along there were people camping all along the sides of the road in the forest. It had apparently rained in the last couple days and the roads were rough, but I was negotiating it just fine by driving slowly. Then we got in trouble. I was going around a huge puddle when I didn't quite make it through the mud on the side of the puddle that I couldn't see. Yep, we were stuck firm in my little front wheel drive Focus. So, not wanting to make it worse we just put the car in park and got out to look. Oi! I couldn't even get out on the drivers side! It was bad. People camping nearby came over to help us (bless them!) and tried pushing, and putting rocks and gravel down, but we only managed to get it in deeper, and get mud everywhere. The true irony is that I just spent $70 to get my carpets and seats shampooed and an express detail of my interior, and because I needed the window down to talk with them, mud got all over the inside of the car. After a while, and realizing that the nearest phone was closed for the night (15 miles away) and we had no phone service, no clue where our friends were camped, and no way out, we unloaded the car, pitched the tent, and went to bed. I got up at dawn the next morning, set up a mini kitchen and unloaded the car completely to lighten it. After Chris got up, we went over and thanked our neighbors, then decided that it was two miles to the resevoir. So, we went for a hike. Lo and behold, we found a developed campground, with (gasp) bathrooms (I had to pee in the woods twice that night... ugh) and the gang. On the map on the link, we would have been stuck right under the 1 on FR 751. We had breakfast with them, and all went in Rod's jeep to assess the situation. We knew we could call Kelly and Dave (the ones with the cabin) for backup if need be, since Dave is on the Volunteer fire dept and has a lot of connections in the area. The guys decided that they could push it out if I reversed and there was room to drive around the mud if I got unstuck. It took some effort and tense moments (they physically lifted the front end of the car up and out of the mud) but the magic moment happened! I moved, and then moved some more, and then.... I was FREE!! Woot! The 3 surrounding campsites gave an ovation when they saw the car move. The car was covered, but fine, and we broke down our mini camp and headed back to the campground. After a quick set up, since you never know up there when you will get a sudden rain storm, and a visit from Kelly & Dave, we headed out the Dam and Reservoir and swam and fished. That water was freezing! 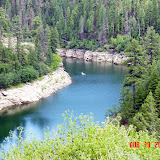 The reservoir is apparently the deepest in AZ and has good trout fishing. The rest was pretty typical- a lot of peace and quiet, good times, watching lightning in the distance (we never got a storm!) and trying to sleep. I was up at dawn again this morning and we had a good breakfast, packed up and came home. We even survived the huge interstate backup where we went 5 miles in 1 1/2 hours!